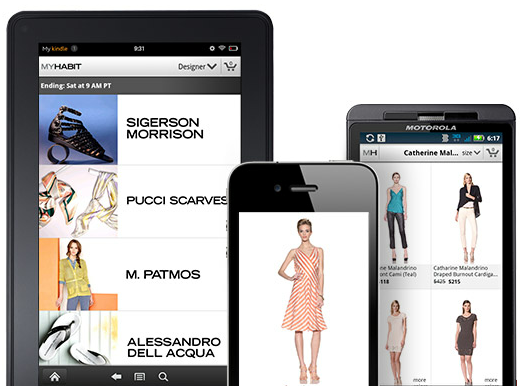 Amazon.com this morning announced that it has released free, native mobile apps for private fashion sales site MYHABIT.com, a fully-owned subsidiary of the ecommerce juggernaut, for its Kindle Fire tablet computer and Android handsets (running version 2.1 and up). The company released a MYHABIT.com iPhone app back in August 2011. Launched back in May 2011, MYHABIT.com customers can use the app to shop limited-time discount sales of leading fashion brands and stay informed with start-of-sale reminders on upcoming events for women, men, designer, children and home. With the private sales site, Amazon.com aims to rival companies like Vente Privée, Gilt Groupe, Beyond The Rack and HauteLook (Nordstrom). MYHABIT.com offers free shipping (and return shipping) on eligible U.S. orders and flat-rate $15 international shipping to select countries.